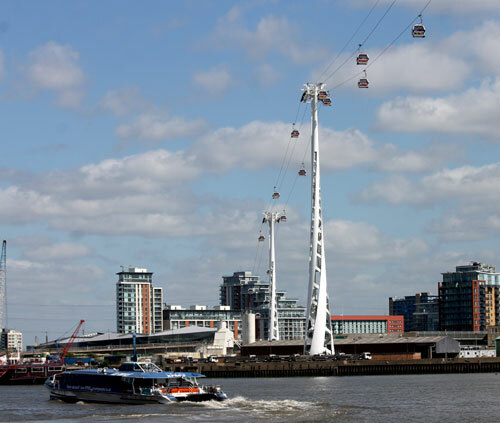 When I showed Nicktor a photograph of the Emirates Air-line, stretched across the Thames, he didn’t think it was real. Today I set out to convince him otherwise. I had planned my day out perfectly. 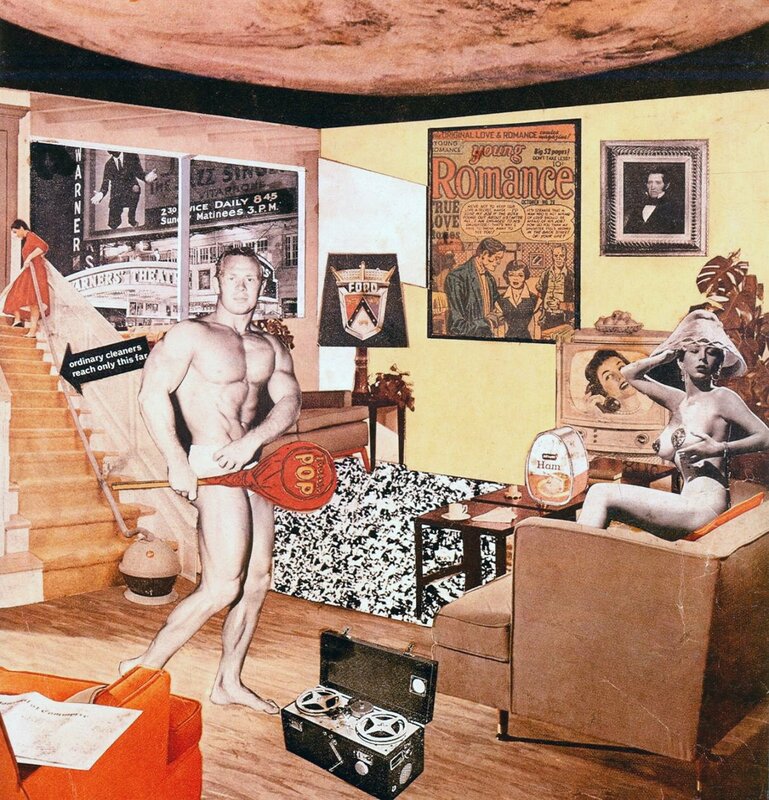 I’d booked a ticket to go to the Richard Hamilton retrospective at Tate Modern first thing – Tuesday at 10am really is the BEST time to go anywhere – and decided I could get a ferry from Bankside to North Greenwich from whence the mystical Air-line departs. As it turned out…everything worked out perfectly. I even overheard this incredibly funny conversation. A German tourist (you have to imagine his very heavy accent) approached an official looking chap at the ferry ticket window. TOURIST: Excuse me, I wonder, could I ask you a question? GUY: Of course, sir. That’s what I’m here for. TOURIST: I was wondering…which way is the sea? GUY: [after a lovely pause, he pointed towards the east] That way, sir. GUY: Well, sir, it’s a tidal river. [Pause] And, at the moment, the tide is coming in. TOURIST: AH! Of course. Tidal river. This water comes from the sea. In that direction? GUY: Yes, sir. And, if you come back in about six hours, you can watch it going back out to sea. TOURIST: Thank you, thank you. It doesn’t sound as funny when written down. Shame because it had me in stitches. However, that was after seeing the Richard Hamilton exhibition which, I am pleased to say, was wonderful. Although I’d never heard of him, I was familiar with a couple of his works (so I discovered at the exhibition). According to something I read at the Tate, he was the first person to coin the term ‘pop art’. I don’t know how much truth there is in that statement but he seems like the sort of cool dude who would have said it first. One of the pieces I knew was Just what is it that makes today’s homes so different, so appealing?, a collage reproduced below. It was made by cutting ads out of magazines. It’s very clever but also quite humorous. But that’s not the only sort of thing that Hamilton created. He changed medium and style as the need struck or his natural curiosity impelled him. He seems like he was a lovely man. He has a very friendly face, at any rate. And I’ve seen it a lot of times. You see, when he was visiting Roy Lichtenstein in 1968, he had his photo taken with a Polaroid camera. When he returned to the UK, Hamilton decided to buy a Polaroid of his own and get everyone he knew to take a single photo of him. Which they did. He published four volumes of them between 1971 and 2001. I saw about 70 of them today. However, my favourite piece (of course, there has to be a favourite) was An Annunciation. It’s difficult to see the overall effect of the piece from the image below but it was as if you were looking into a room that was inside another room. Your eyes are drawn deep into the other room and it’s difficult to look away. A beautiful piece. And talking of beautiful…it was a beautiful day as well. 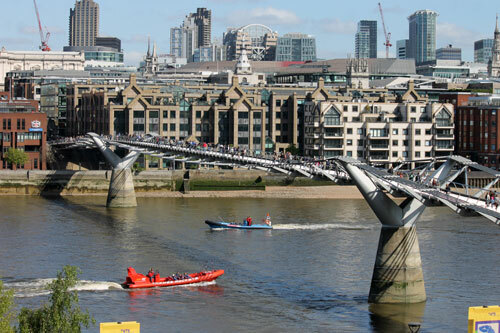 Stepping out, onto the Tate balcony, I was stunned by how glorious the Thames looked in the sun. 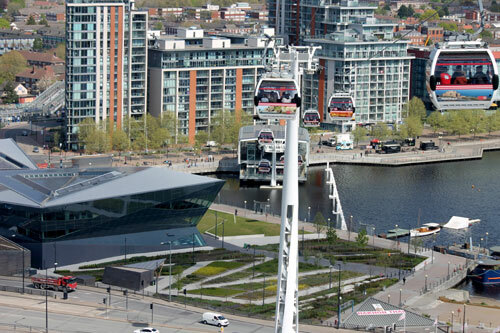 But that was nothing compared to the amazing views from the Emirates Air-line! Truly breathtaking. Especially when the little capsule bumps over the cable stretched between the pylons 295 feet above the water. And the capsules really are quite small. They are supposed to seat ten. I reckon they’d sit ten five year olds. Adults, you’re looking at more like six…and they’d need to know each other quite well. I’m making it sound awful but it was far from it. An amazing experience. Mirinda claims that there’s people who commute on it. How incredible would that be? Anyway, here’s a few shots of and from it (there’s a few more in my Flickr account). I think it’s something that everyone should do when they’re in London. Of course, it would have to be a nice day. Perhaps I was just lucky. Mirinda says I’m ‘jammy’. Anyway, that’s the most exciting thing I’ve done for a long time. I needed to rest after that. Oh, except for moving the bed a few inches. This entry was posted in Gary's Posts and tagged air-line, Emirates, ferry, Thames, transport. Bookmark the permalink. Need to rest, Gary! your showing your age my son.